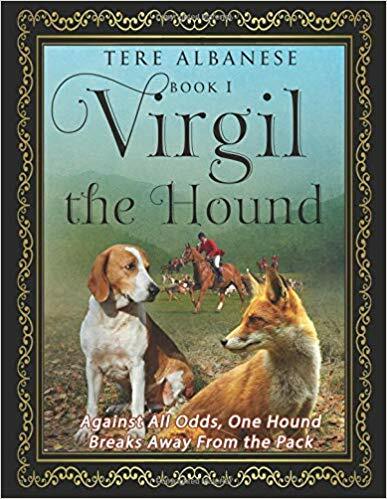 This is a story about a royally bred foxhound named Virgil, who does not want to hunt and kill foxes, or anything else for that matter. And it is how Virgil's point of view profoundly changed one of the hunter's point of view on hunting. Tere Albanese was born in Newark, New Jersey. Her grandmother bought her a piano and her mother sent her to ballet classes. When she was nine-years-old, her parents moved the family to Chatsworth, a suburb of Los Angeles, California. Tere had not been exposed to horses in N.J., but she was surrounded by them in California. She immediately traded in her ballet slippers for riding boots, and the piano is still gathering dust. She started writing, and riding horses,when she moved to California. She showed hunter/jumpers, fox hunted and galloped racehorses at Santa Anita Park. Before graduating from UCLA, she became a racing journalist. After graduating from college, Tere became an English and Social Science teacher teaching in middle schools and high schools. She has taught for 15 years. Her first book is Virgil the Hound. Virgil is a royally bred foxhound, who refuses to hunt foxes. He teaches the hunter, and the reader, more than one life lesson.